The son of a U.S. Army chaplain, Groves lived at various Army posts during his childhood. In 1918, he graduated fourth in his class at the U.S. Military Academy at West Point and was commissioned into the U.S. Army Corps of Engineers. In 1929, he went to Nicaragua as part of an expedition to conduct a survey for the Inter-Oceanic Nicaragua Canal. Following the 1931 earthquake, Groves took over Managua's water supply system, for which he was awarded the Nicaraguan Presidential Medal of Merit. He attended the Command and General Staff School at Fort Leavenworth, Kansas, in 1935 and 1936; and the Army War College in 1938 and 1939, after which he was posted to the War Department General Staff. Groves developed "a reputation as a doer, a driver, and a stickler for duty" and in 1940 he became special assistant for construction to the Quartermaster General, tasked with inspecting construction sites and checking on their progress. In August 1941, he was appointed to create the gigantic office complex for the War Department's 40,000 staff that would ultimately become the Pentagon. In September 1942, Groves took charge of the Manhattan Project. He was involved in most aspects of the atomic bomb's development: he participated in the selection of sites for research and production at Oak Ridge, Tennessee; Los Alamos, New Mexico; and Hanford, Washington. He directed the enormous construction effort, made critical decisions on the various methods of isotope separation, acquired raw materials, directed the collection of military intelligence on the German nuclear energy project and helped select the cities in Japan that were chosen as targets. Groves wrapped the Manhattan Project in security but failed to prevent the Soviet Union from conducting a successful espionage program that stole some of its most important secrets. After the war, Groves remained in charge of the Manhattan Project until responsibility for nuclear weapons production was handed over to the United States Atomic Energy Commission in 1947. He then headed the Armed Forces Special Weapons Project, which had been created to control the military aspects of nuclear weapons. He was given a dressing down by the Army Chief of Staff, General of the Army Dwight D. Eisenhower, and told that he would never be appointed Chief of Engineers. Three days later, Groves announced his intention to leave the Army. He was promoted to lieutenant general just before his retirement on 29 February 1948 in recognition of his leadership of the bomb program. By a special Act of Congress, his date of rank was backdated to 16 July 1945, the date of the Trinity nuclear test. He went on to become a vice-president at Sperry Rand. Leslie Richard Groves Jr. was born in Albany, New York, on 17 August 1896, the third son of four children of a pastor, Leslie Richard Groves Sr., and his wife Gwen née Griffith. He was half Welsh and half English, with some French Huguenot ancestors who came to the United States in the 17th century. Leslie Groves Sr. resigned as pastor of the Sixth Presbyterian church in Albany in December 1896 to become a United States Army chaplain. He was posted to the 14th Infantry at Vancouver Barracks in Washington in 1897. Following the outbreak of the Spanish–American War in 1898, Chaplain Groves was sent to Cuba with the 8th Infantry. On returning to Vancouver Barracks, he was ordered to rejoin the 14th Infantry in the Philippines; service in the Philippine–American War and the Boxer Rebellion followed. The 14th Infantry returned to the United States in 1901 and moved to Fort Snelling, Minnesota. The family relocated to there from Vancouver, then moved to Fort Hancock, New Jersey, and returned to Vancouver in 1905. Chaplain Groves was hospitalized with tuberculosis at Fort Bayard in 1905. He decided to settle in southern California and bought a house in Altadena. His next posting was to Fort Apache, Arizona. The family spent their summers there and returned to Altadena where the children attended school. In 1911, Chaplain Groves was ordered to return to the 14th Infantry, which was now stationed at Fort William Henry Harrison, Montana. At Fort Harrison, Groves met Grace (Boo) Wilson, the daughter of Colonel Richard Hulbert Wilson, a career Army officer who had served with Chaplain Groves during the 8th Infantry's posting to Cuba. In 1913, the 14th Infantry moved once more, this time to Fort Lawton in Seattle, Washington. Groves entered Queen Anne High School in 1913, and graduated in 1914. While completing high school, Groves also enrolled in courses at the University of Washington, in anticipation of attempting to gain an appointment to the United States Military Academy. Groves earned a nomination from President Wilson, which allowed him to compete for a vacancy, but did not score high enough mark on the examination to be admitted. Charles W. Bell from California's 9th congressional district nominated Groves as an alternate, but the principal nominee accepted. Instead, Groves enrolled at the Massachusetts Institute of Technology (MIT) and planned to re-take the West Point entrance exam. In 1916, Groves tested again, attained a passing score, and was accepted. He later said "Entering West Point fulfilled my greatest ambition. I had been brought up in the Army, and in the main had lived on Army posts all my life." Groves' class entered West Point on 15 June 1916, but the United States declaration of war on Germany in April 1917 led to their program of instruction being shortened as the War Emergency Course (WEC), which graduated on 1 November 1918, a year and a half ahead of schedule. Groves finished fourth in his class, which earned him a commission as a second lieutenant in the Corps of Engineers, the first choice of most high ranking cadets. At MIT he had played tennis informally but at West Point he could not skate for ice hockey, did not like basketball, and was not good enough for baseball or track. So football was his only sport. He said that "I was the number two centre but was on the bench most of the time as in those days you didn’t have substitutes and normally the number one played the whole game. I was not very heavy, and today would be considered too light to play at all". During the first week that I was on duty there, I could not walk out of my office down the corridor to Hartman's office without being literally assailed by the officers or civilian engineers with liaison responsibility for various camps. It is no exaggeration to state that during this period decisions involving up to $5,000,000 [$89,000,000 with inflation] were made at the rate of about one every 100 feet of corridor walked. Groves instituted a series of reforms. He installed phone lines for the Supervising Construction Quartermasters, demanded weekly reports on progress, ordered that reimbursement vouchers be processed within a week, and sent expediters to sites reporting shortages. He ordered his contractors to hire whatever special equipment they needed and to pay premium prices if necessary to guarantee quick delivery. Instead of allowing construction of camps to proceed in whatever order the contractors saw fit, Groves laid down priorities for completion of camp facilities, so that the troops could begin moving in even while construction was still under way. By mid-December, the worst of the crisis was over. Over half a million men had been mobilized and essential accommodations and facilities for two million men were 95 per cent complete. Between 1 July 1940 and 10 December 1941, the Construction Division let contracts worth $1,676,293,000 ($28,553,900,000 with inflation), of which $1,347,991,000 ($22,961,600,000 with inflation), or about 80 per cent, were fixed-fee contracts. On 19 August 1941, Groves was summoned to a meeting with the head of the Construction Division, Brigadier General Brehon B. Somervell. In attendance were Captain Clarence Renshaw, one of Groves' assistants; Major Hugh J. Casey, the chief of the Construction Division's Design and Engineering Section; and George Bergstrom, a former president of the American Institute of Architects. Casey and Bergstrom had designed an enormous office complex to house the War Department's 40,000 staff together in one building, a five-story, five-sided structure, which would ultimately become the Pentagon. The Pentagon had a total square footage of 5,100,000 square feet (470,000 m2)—twice that of the Empire State Building—making it the largest office building in the world. The estimated cost was $35 million ($596,200,000 with inflation), and Somervell wanted 500,000 square feet (46,000 m2) of floor space available by 1 March 1942. Bergstrom became the architect-engineer with Renshaw in charge of construction, reporting directly to Groves. At its peak the project employed 13,000 persons. By the end of April, the first occupants were moving in and 1,000,000 square feet (93,000 m2) of space was ready by the end of May. In the end, the project cost some $63 million ($1,073,100,000 with inflation). Meanwhile, Groves had met with J. Robert Oppenheimer, the University of California, Berkeley physicist, and discussed the creation of a laboratory where the bomb could be designed and tested. Groves was impressed with the breadth of Oppenheimer's knowledge. A long conversation on a train in October 1942 convinced Groves and his deputy Kenneth Nichols that Oppenheimer thoroughly understood the issues involved in setting up a laboratory in a remote area. These were features that Groves found lacking in other scientists, and he knew that broad knowledge would be vital in an interdisciplinary project that would involve not just physics, but chemistry, metallurgy, ordnance, and engineering. In October 1942 Groves and Oppenheimer inspected sites in New Mexico, where they selected a suitable location for the laboratory at Los Alamos. Unlike Oak Ridge, the ranch school at Los Alamos, along with 54,000 acres (22,000 ha) of surrounding forest and grazing land, was soon acquired. Groves also detected in Oppenheimer something that many others did not, an "overweening ambition" which Groves reckoned would supply the drive necessary to push the project to a successful conclusion. Groves became convinced that Oppenheimer was the best and only man to run the laboratory. Few agreed with him in 1942. Oppenheimer had little administrative experience and, unlike other potential candidates, no Nobel Prize. There was also concern about whether Oppenheimer was a security risk, as many of his associates were communists, including his brother Frank Oppenheimer, his wife Kitty, and his girlfriend Jean Tatlock. Oppenheimer's Communist Party connections soon came to light, but Groves personally waived the security requirements and issued Oppenheimer a clearance on 20 July 1943. Groves' faith in Oppenheimer was ultimately justified. Oppenheimer's inspirational leadership fostered practical approaches to designing and building bombs. Asked years later why Groves chose him, Oppenheimer replied that the general "had a fatal weakness for good men." Isidor Rabi considered the appointment "a real stroke of genius on the part of General Groves, who was not generally considered to be a genius ..."
The Combined Development Trust was established by the governments of the United Kingdom, United States and Canada in June 1944, with Groves as its chairman, to procure uranium and thorium ores on international markets. In 1944, the trust purchased 3,440,000 pounds (1,560,000 kg) of uranium oxide ore from companies operating mines in the Belgian Congo. In order to avoid briefing Treasury Secretary Henry Morgenthau Jr. on the project, a special account not subject to the usual auditing and controls was used to hold Trust monies. Between 1944 and the time he resigned from the Trust in 1947, Groves deposited a total of $37.5 million into the Trust's account. Groves met with General Hap Arnold, the Chief of U.S. Army Air Forces, in March 1944 to discuss the delivery of the finished bombs to their targets. Groves was hoping that the Boeing B-29 Superfortress would be able to carry the finished bombs. The 509th Composite Group was duly activated on 17 December 1944 at Wendover Army Air Field, Utah, under the command of Colonel Paul W. Tibbets. A joint Manhattan District – USAAF targeting committee was established to determine which cities in Japan should be targets; it recommended Kokura, Hiroshima, Niigata, and Kyoto. At this point, Secretary of War Henry L. Stimson intervened, announcing that he would be making the targeting decision, and that he would not authorize the bombing of Kyoto. Groves attempted to get him to change his mind several times and Stimson refused every time. Kyoto had been the capital of Japan for centuries, and was of great cultural and religious significance. In the end, Groves asked Arnold to remove Kyoto not just from the list of nuclear targets, but from targets for conventional bombing as well. Nagasaki was substituted for Kyoto as a target. 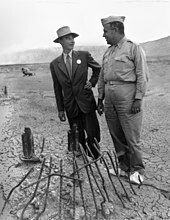 Groves and Oppenheimer at the Trinity test site in September 1945. The white overshoes were to prevent fallout from sticking to the soles of their shoes. Responsibility for nuclear power and nuclear weapons was transferred from the Manhattan District to the Atomic Energy Commission on 1 January 1947. On 29 January 1947, Secretary of War Robert P. Patterson and Secretary of the Navy James V. Forrestal issued a joint directive creating the Armed Forces Special Weapons Project (AFSWP) to control the military aspects of nuclear weapons. Groves was appointed its chief on 28 February 1947. 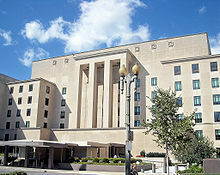 In April, AFSWP moved from the New War Department Building to the fifth floor of the Pentagon. Groves had already made a start on the new mission by creating Sandia Base in 1946. The Army Chief of Staff, General of the Army Dwight D. Eisenhower, met with Groves on 30 January 1948 to evaluate his performance. Eisenhower recounted a long list of complaints about Groves pertaining to his rudeness, arrogance, insensitivity, contempt for the rules and maneuvering for promotion out of turn. Eisenhower made it clear that Groves would never become Chief of Engineers. Groves realized that in the rapidly shrinking postwar military he would not be given any assignment similar in importance to the one he had held in the Manhattan Project, as such posts would go to combat commanders returning from overseas, and he decided to leave the Army. 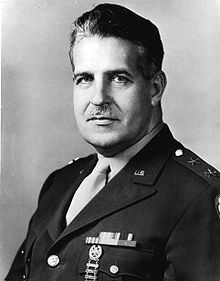 He was promoted to lieutenant general on 24 January 1948, just before his retirement on 29 February 1948 in recognition of his leadership of the Manhattan Project. By special Act of Congress his date of rank was backdated to 16 July 1945, the date of the Trinity nuclear test. Groves went on to become a vice president at Sperry Rand, an equipment and electronics firm, and moved to Darien, Connecticut, in 1948, and retired at age 65 in 1961. He also served as president of the West Point alumni organization, the Association of Graduates. 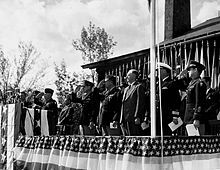 He presented General of the Army Douglas MacArthur the Sylvanus Thayer Award in 1962, which was the occasion of MacArthur's famous Duty, Honor, Country speech to the U.S. Military Academy Corps of Cadets. In retirement, Groves wrote an account of the Manhattan Project entitled Now It Can Be Told, originally published in 1962. In 1964, he moved back to Washington, D.C.
Groves suffered a heart attack caused by chronic calcification of the aortic valve on 13 July 1970. He was rushed to Walter Reed Army Medical Center in Washington, where he died at age 73 that night. A funeral service was held in the chapel at Fort Myer, Virginia, after which Groves was interred in Arlington National Cemetery next to his brother Allen, who had died of pneumonia in 1916. Groves is memorialized at a namesake park along the Columbia River, near the Hanford Site in Richland, Washington. In 2007, Groves was portrayed by Eric Owens in the Lyric Opera of Chicago's work Doctor Atomic. The opera follows Oppenheimer, Groves, Teller and others in the days preceding the Trinity test. In the 1989 film Fat Man and Little Boy, Groves was portrayed by Paul Newman. ^ "General Leslie Groves's Interview - Part 2". Voices of the Manhattan Project. Retrieved 13 September 2018. ^ Ermenc 1989, pp. 208,209. ^ a b c d e Federal Reserve Bank of Minneapolis Community Development Project. "Consumer Price Index (estimate) 1800–". Federal Reserve Bank of Minneapolis. Retrieved 2 January 2019. ^ Nichols 1987, p. 132. ^ "Headed A-Bomb Development - Heart Attack Claims Life Of Lt. Gen. Leslie Groves (1970)". Standard-Speaker. 15 July 1970. p. 1. Retrieved 25 June 2017. ^ "A-bomb's boss dies after heart attack". Eugene Register-Guard. Oregon. UPI. 14 July 1970. p. 1A. Retrieved 15 March 2018. ^ "General dies". Spokane Daily Chronicle. (Washington). Associated Press. 14 July 1970. p. 1. Retrieved 15 March 2018. ^ "Sounds of silence resonate in Lyric's "Doctor Atomic" (Oppenheimer & Groves) (2007)". The Daily Herald. 16 December 2007. p. 32. Retrieved 25 June 2017. Ermenc, Joseph J., ed. (1989). Atomic Bomb Scientists: Memoirs, 1939-1945. Westport, Connecticut: Meckler. ISBN 0-88736-267-2. OCLC 708445679. "The First Nuclear Test in New Mexico". WGBH American Experience. 18 July 1945. Archived from the original on 11 September 2015. Retrieved 14 September 2015. Memorandum for the Secretary of War, Groves describes the first Trinity (nuclear test) in New Mexico.